Let’s face it, no one uses Adobe Acrobat for fun. First developed as a PDF authoring tool in 1993, its technical presence now figures heavily in publishing as well as a vast range of professional enterprises. 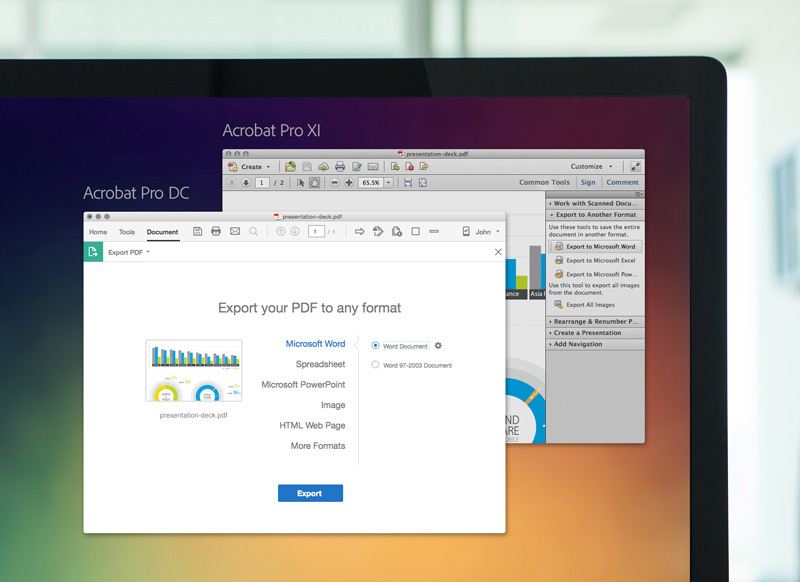 Adobe has now made available the 12th version of Acrobat, now called Acrobat DC, for Adobe’s new Document Cloud platform, integrating desktop and mobile apps and services. The new Document Cloud is analogous to Adobe’s other clouds — Creative Cloud and Marketing Cloud — whose primary goal is to keep tools and documents close at hand so users can work on and interact with them from anywhere at anytime. With Acrobat DC, Adobe strives to retain and improve the most popular features from previous versions. 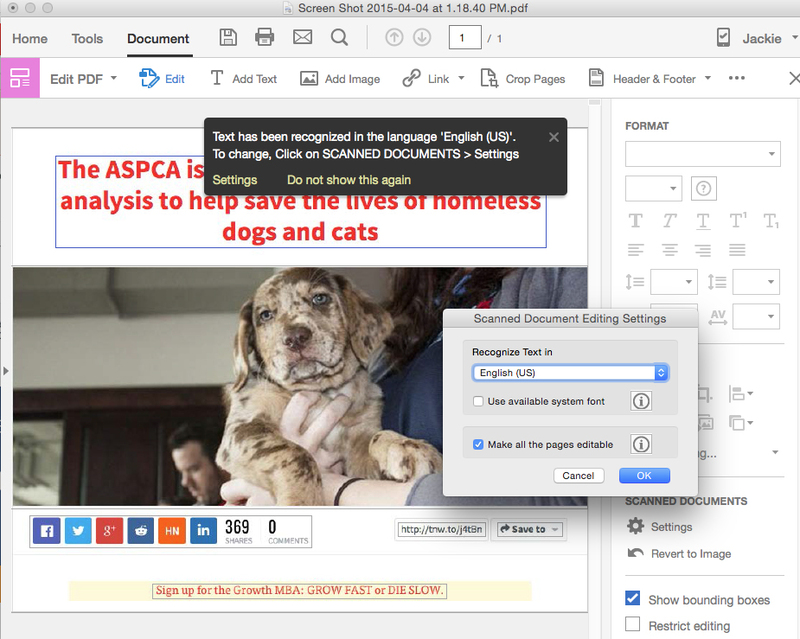 These include creating, editing and converting PDF files, redacting text and creating fillable PDF forms. But it also introduces a significant number of new features, such as a touch interface, à la Photoshop and Illustrator, which can now be used with the Microsoft Surface Pro 3. 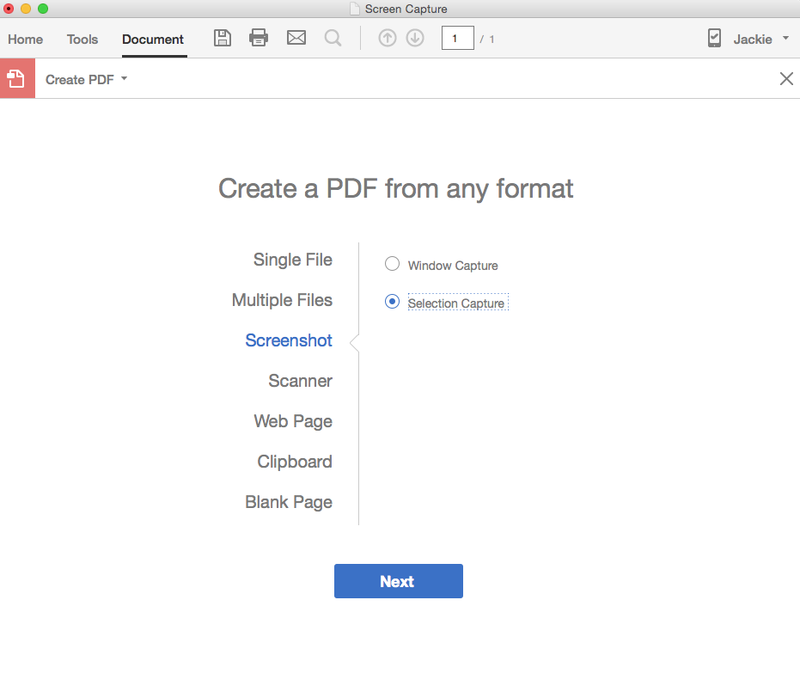 New PDF creation tools let you store and share files online and access recent files. You can now electronically send, track and confirm delivery of documents; recognize text in scans and preview and fix errors; automatically fix photos and create high-quality PDFs in Microsoft Word for Mac. 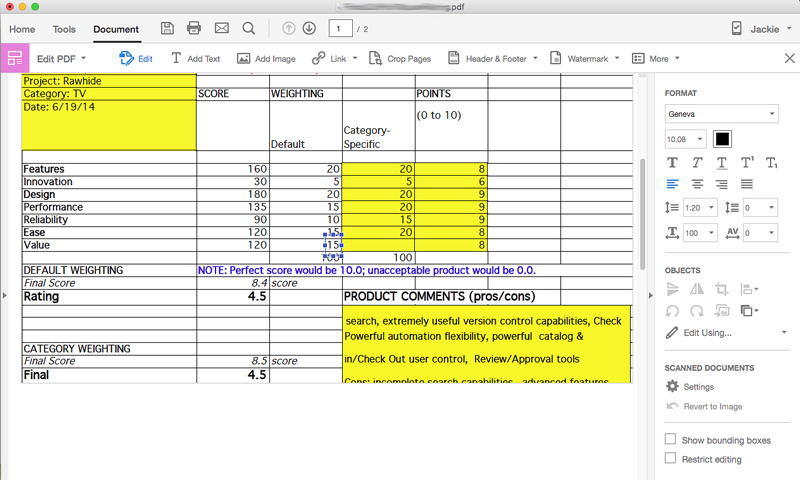 Upgraded editing features include full-page paragraph reflow; improved formatting for editable, translated Microsoft Word, Excel, or PowerPoint files; editing and organizing on the iPad and transforming scanned paper documents into editable PDF files. The app now uses smart autofill to fill, sign and send forms from your computer or mobile device as well as collect e-signatures and track responses. To save files in Adobe Document Cloud, just enable the Mobile Link switch after you sign in. New accessibility features include voice input on the Mac and dynamic background adjustment on the PC. TNW obtained a pre-release beta of Acrobat DC to try out in conjunction with Acrobat DC and Adobe Fill & Sign for the iPad. Based on my experience with these apps, longtime Acrobat rustlers will have no problem adapting to the new, more intuitive interface, and it surely will be less intimidating for new users. 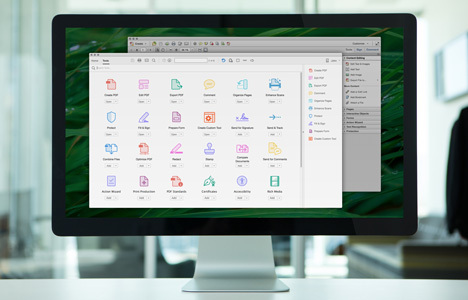 Acrobat never had the sheer beauty of Photoshop or Illustrator and does not now, but the company has tried over the years to streamline and make Acrobat friendlier and more intuitive. With Acrobat DC, Adobe has undertaken the largest overhaul yet to the interface of this complex app. The last couple of updates represented something of a hybrid between the menu driven interface of the past and a more context-sensitive visual approach. Acrobat DC finishes the job. The Tool Center: icon-based shortcuts let you see the major functions available. The updated welcome screen provides a lot of information, but it’s easy to follow, with menu items tracing recent and sent documents as well as giving access to files parked in the cloud. 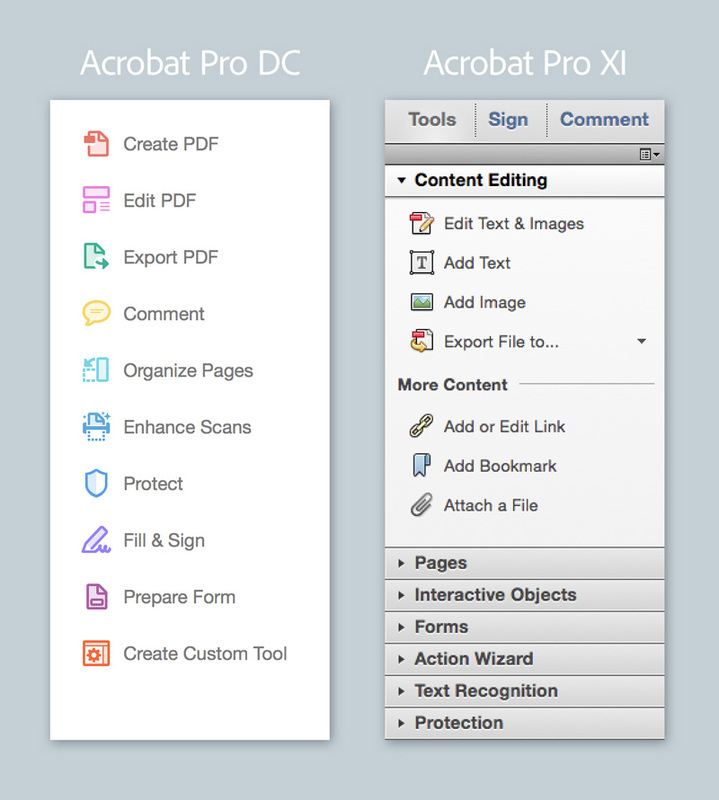 Acrobat DC’s new Tool Center eliminates hunting through nested menus to find the right tools. The new look goes all colorful, flat icon in an updated, non-skeuomorphic style. Each item has a drop-down menu that takes you to its functions. You can hide or show the menu in the sidebar, which I found it easier, because you just need to click to see all the possible actions available from a particular tool. Depending on the action selected under the Edit PDF menu, other tools appear in the menu bar and right pane. This new interface has a logical flow and does not feel disjointed. Each shortcut opens to a full slate of options. 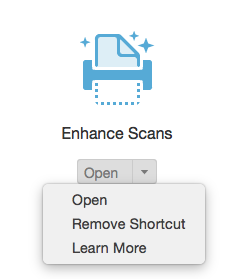 Open any document as a PDF file. A full slate of tools appears on the right, corresponding to the function. Text boundaries still a bit overlapped a bit on imported Excel documents and, as in previous versions, you still have to maneuver within cells to get some type placed correctly. If you need a particular tool, you can search anywhere in the app by name and the tool will open in a new window. Just click to use that tool with your last document. The new Acrobat lets you customize the toolbar by letting you delete tools you aren’t using, though you can restore shortcuts later. An OS X style heads-up display gives you common viewing controls. 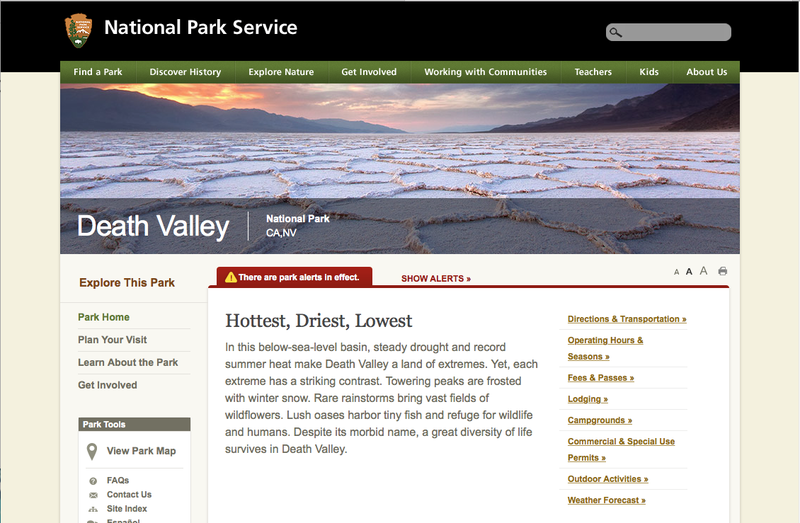 Hover the cursor at the bottom of the screen to view it or drag it to the top of the screen. It appears whenever you hover the cursor in that area. Converting scanned documents into instantly editable PDFs is much easier in this version and the results are quite presentable, thanks to embedded Photoshop technology. When you insert text, the font matches the original text—even if you don’t have the font on your system, and even if the print has flaws. 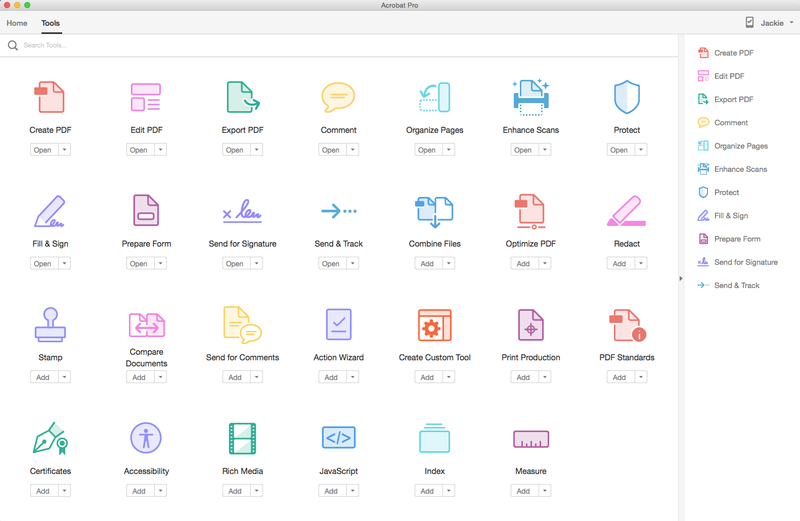 Acrobat DC automatically recreates fonts for you. Font matching even as type is replaced with non-system fonts. Note the heads up display. 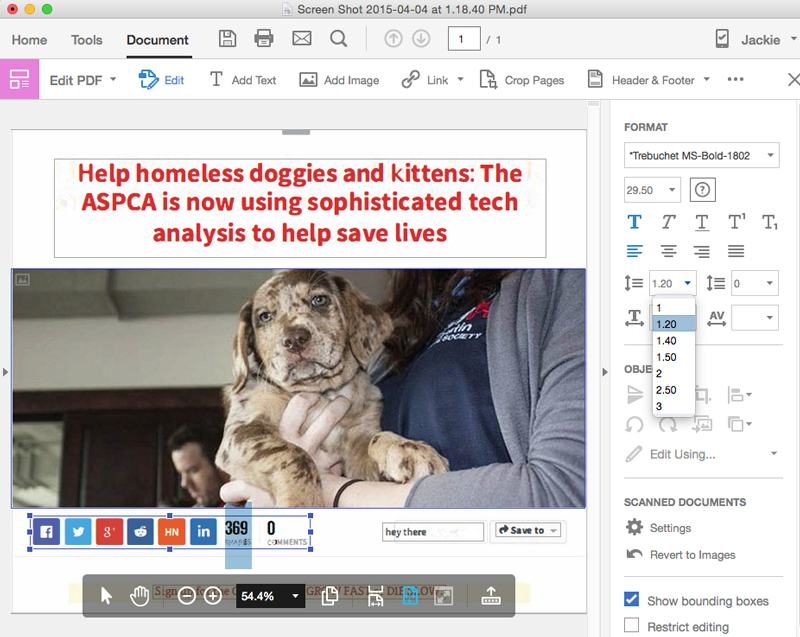 The app automatically makes documents editable when you click the Edit PDF tool, so that converting a scanned image to text is a one-step process. 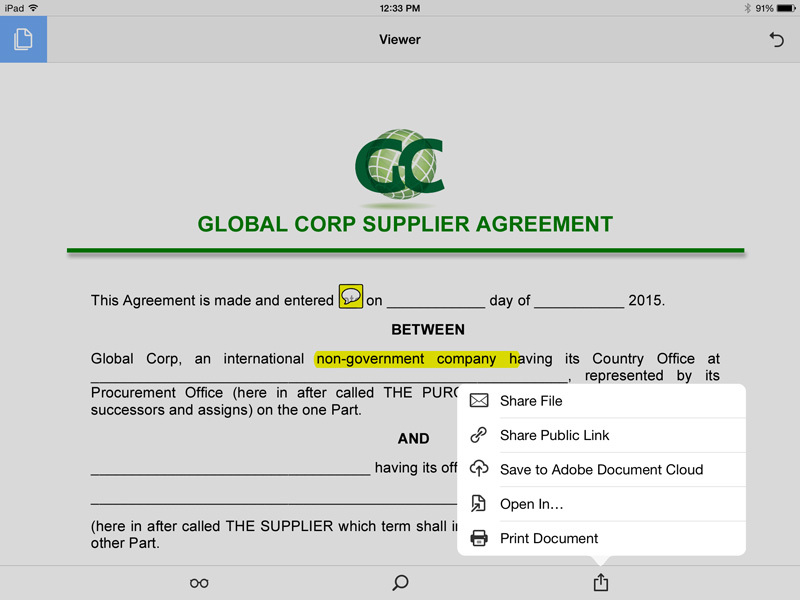 Several years ago, Adobe introduced a mobile signing feature called EchoSign and made it available for some versions of Acrobat to let people sign important documents on-the-go. With Document Cloud, Adobe has renamed EchoSign to eSign Services and includes it in every subscription of Acrobat DC and Adobe Creative Cloud. Signing forms was surprisingly seamless. I used the new Adonit Jot Script 2 pen to sign this on my iPad Air 2, but you can also use your finger to sign. The new Acrobat gives you access your work — files, settings and signatures — as you move between desktop and devices with the new Mobile Link function. Two new mobile apps—Acrobat DC Mobile and Fill and Sign— let you to create, edit, comment and sign documents on your mobile devices. This new mobile app works precisely as advertised. Made with Photoshop imaging technology, the idea is that you can use the camera to shoot an image of a form document and then be able to fill it in. 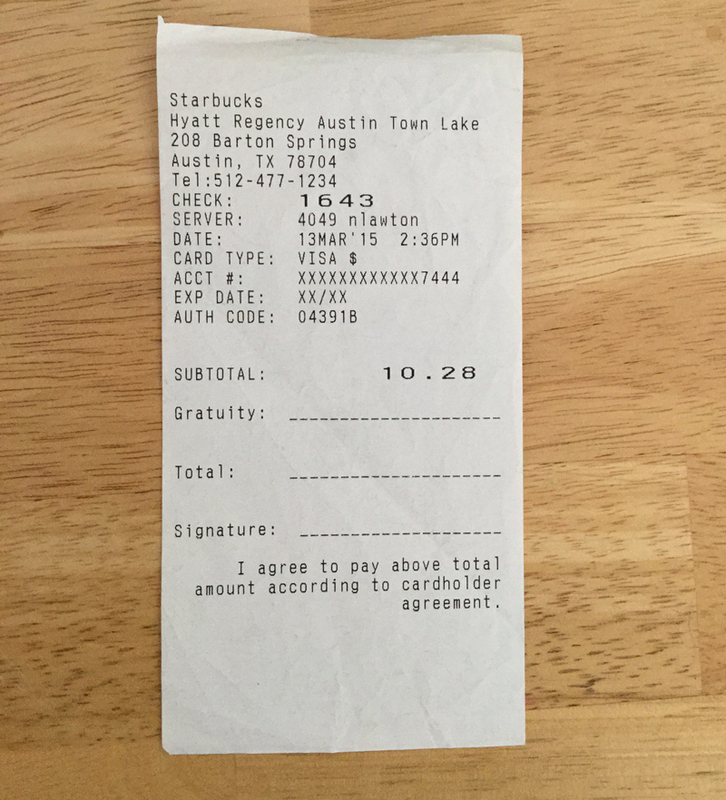 Photoshop technology in Acrobat makes this receipt scan easier to read. I took a random form and shot an image with my iPad and then filled it in. 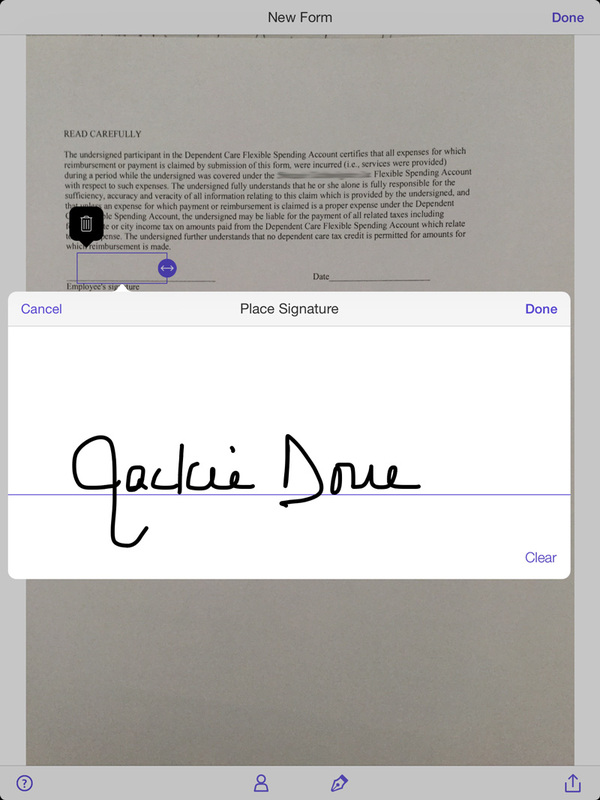 You can also sign and share documents with your own dynamically generated signature. The mobile version of Acrobat provides round-trip functionality between the desktop and your mobile device. It’s free from the App Store, and with it you can share and mark up documents in various ways including Document Cloud, Creative Cloud, or by email or public link. As long as you are signed in to your account, you can access and work with all documents created, saved and shared within the system. Under the home button, you’ll find the recent documents you’ve been working on. You can search within those documents, edit them, export to various formats like Microsoft Word, Excel and RTF, take and include new photos, and more. Every recent document you worked on is immediately available. Acrobat is available in standard and pro versions, and in both perpetual licenses and subscriptions. Be sure to check which capabilities and services are included in the license and version you choose. The electronic send, track and delivery of documents, for example, is available only with a subscription. And only pro versions let you create PDFs in Microsoft Word for Mac or turn scanned paper documents into editable PDFs. Mark up documents on your iPad. Acrobat DC is a radically changed app compared to earlier versions. I was impressed that despite the large number of interface changes, it was easy for previous users to navigate and find familiar functions. Acrobat is never an app you choose — it is an app you need to use for specific purposes. And while Acrobat will likely never be one of those “fun” creative apps, like Photoshop or Dreamweaver, this version transforms it into something both more functional and user friendly — something not to dread. Adobe is offering a free 30-day trial for Acrobat Pro DC for Windows and Mac. Subscriptions are $14.99 and $12.99 per month for the Pro and Standard versions respectively, and it’s included in all Creative Cloud subscriptions. Perpetual licenses are $449 ($199 upgrade) and $299 ($139 upgrade) for Pro and Standard versions respectively. Adobe has information about volume licenses on its Web site. Acrobat DC works with Mac OS X 10.9 or higher and Windows 7 or higher and Vista. Mobile apps are compatible with iOS 8 or later, Android 4 or later and Windows Phone 7.5 or later.